Here is the first of the profiles of shops that will be at the Waverley Patchworkers Quilt Show 2018 this coming weekend at Mulgrave Community Centre. I am not sure who enjoys Mrs Martins Quilt Shop more, Karen or her customers. She has promised to bring lots of samples to inspire your next project. She has a range of hand dyed walls and patterns that use wools and felts, along with Moda pre cuts and a basket full of fat 16ths that are mainly small print reproductions. To help with stitcheries there will be transfer paper that will go with through your printer. If you are looking for a bargin Karen is selling bolt ends at $10 a metre. 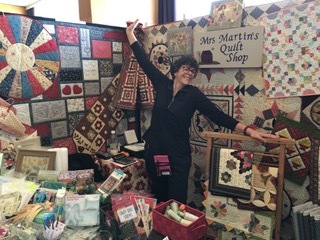 This entry was posted in Quilt Show and tagged Mrs Martin's Quilt Shop. Bookmark the permalink.